Hello, fellow Zara shoe lover. I hope your credit card is handy because the high-street brand just dropped hundreds of shoes, and my self-control just went out the window. As you've probably noticed, Zara has steadily been stocking up on autumn 2018 pieces, and there are plenty of shoes to go along with the check, animal print, cosy colours, and denim that are key for A/W 18. With that, allow me to present the best Zara shoes for this upcoming season. For A/W 18, the overarching shoe trends are Western, croc-embossed, '90s-inspired and leopard print. All of these and more are present and accounted for in Zara's latest crop of new arrivals, and there are 27 pairs that I'm really into. Yes, I know that's a lot of shoes to have on your wishlist at once, but once you see them for yourself, you will likely understand. 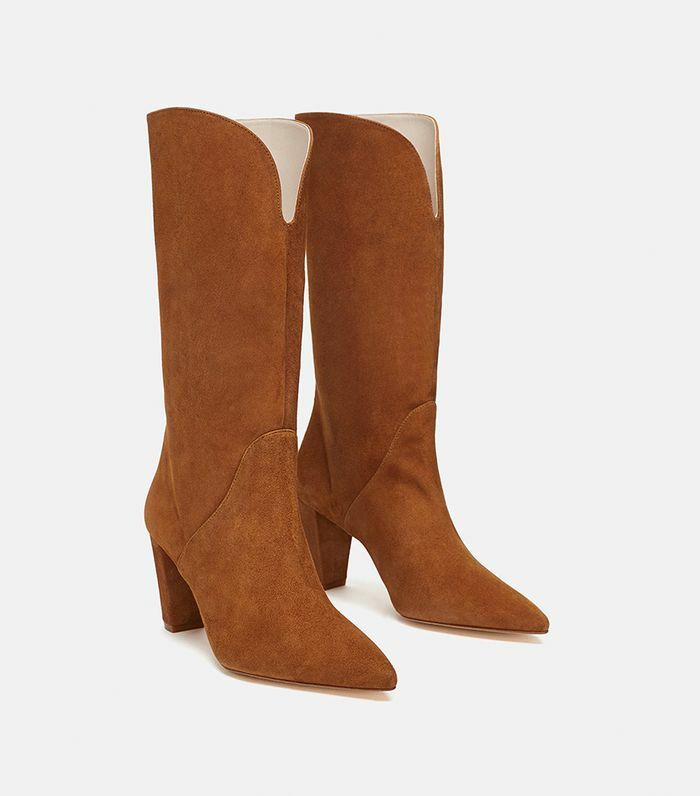 Read on to join me in my Zara-induced shoe panic and shop until your heart's content (just be sure to scroll all the way to the bottom—I saved the very best pair for last). Meet your new favorite boots to wear with skinny jeans. Easily transition into autumn with these rich brown sandals. Business in the front, and party in the back. Colour combinations don't get prettier than this. These beauties are shockingly versatile. White shoes are still trending, so you might as well get a new pair. Stock up on croc for the new season. If these don't look expensive to you, I don't know what does. Meet your new jeans-and-a-tee shoes. Yes, you need another pair of black shoes when they look like this. One of several very cool pairs of snakeskin shoes Zara is pushing right now. Wear these with cropped jeans or trousers to show off the straps. This is what I call an evening ankle boot. Orange heels look surprisingly chic for autumn. Found: You're new party shoes. These are the perfect transitional pumps. The coolest new shoe style to wear with a slip dress. Dad sneakers don't have to be designer. I plan on pairing these with black jeans. There's always room for another pair of metallic sandals. These are the pair I'm 100% buying. Next up, see our guide to the biggest trends for autumn/ winter 2018.